Marigold Hotel Shaving Soap has notes of ripe currants, fresh squeezed limes, juicy nectarine, Oakwood, Patchouli and hints of fruit and leather. Marigold Hotel Shaving Soap has notes of ripe currants, fresh squeezed limes, juicy nectarine, Oakwood, Patchouli and hints of fruit and leather. It is tallow based with mango butter for a premium shaving experience and stearic acid for naturally stable, thick lather that lasts. 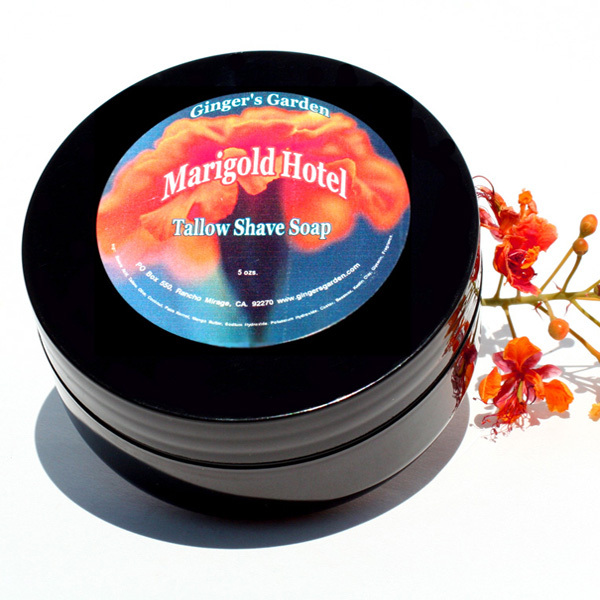 Ginger’s Garden tallow soaps lather quickly with great cushion and glide. This is a true, old fashioned shaving soap made specifically for wet shaving. Can be lathered straight in the jar or add Marigold Hotel soap to your scuttle or shave bowl and whip up lots of cushioning lather. Say goodbye to razor burn and hello to a close, comfortable shave. Experience wet shaving the way it was meant to be. Ginger’s Garden shaving soaps are made in Palm Springs, California and cured for 4-6 weeks. This makes the water during the soapmaking process evaporate and makes the shaving soap milder.